Tony Iacconi, hailing from Newcastle Australia, won the first in augural Drug Aware Action Sports Games in Bunbury yesterday with an amazing run in the final with a total score of 81.66. He beat off a world class field with Mike Dowdy (USA) finishing narrowly behind him with a score of 77.22. Water conditions in the morning were poor and the tournament had to go on hold till the easterly winds backed out and then head judge Cory Harris made the call to start. 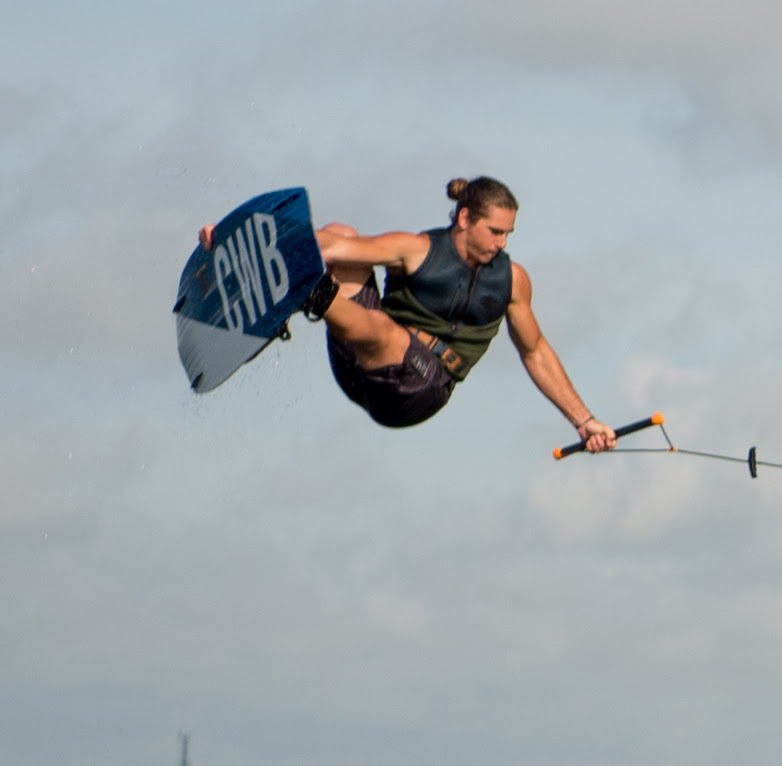 “Conditions have improved enormously, the wind is down to a gentle 5 knots, recreational boat traffic has slowed down and we are ready to put on a show of world class wakeboarding for the people of Western Australia” said Harris. 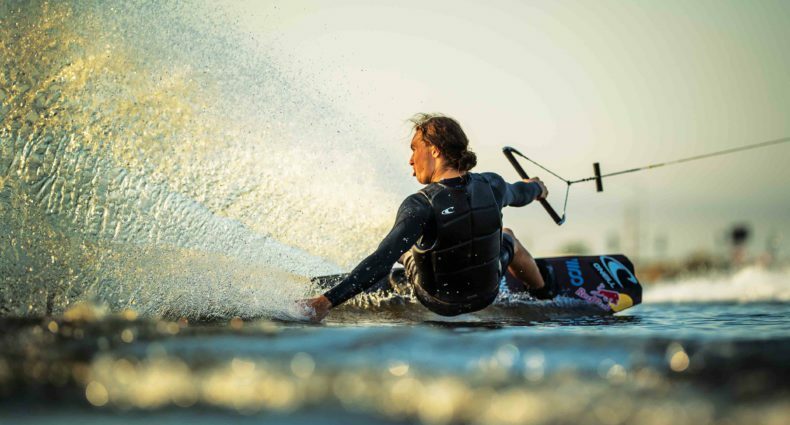 Australian Wakeboard legends Harley Clifford, Tony Iacconi, Nick Rapa and Cory Teunissen, were ready to take on USA stars Mike Dowdy, Noah Flegel in an all-out battle of Bunbury. The crowds swelled along the spectacular Koombana Bay foreshore in anticipation as final commenced, then the dolphins came out in force to see what all the fuss was about putting on their own show to delight the crowds. First out in the final was Noah Flegel (USA) with a good run but he fell twice finishing his run, next up was Cory Teunissen (Aus) but the judges were awarding points for major tricks and Cory just fell short on a couple of big manoeuvres. Harley Clifford (Aus) got off to a bad start with his wake rope getting caught up in the dock and snapping back as the big Nautique G23 wakeboard pulled away from the jetty. Not to be deterred the former world champ went to work nailing off some massive tricks but just didn’t get the result. Nic Rappa (Aus) was pumped to get into the action and he was an absolute stand out through the heats and clearly the dark horse in the event. He threw everything he had in his run taking no risk but with a couple of falls that counted him out of a final podium finish. Mike Dowdy (USA) took to water like he’d been in Bunbury all his life and absolutely demolished his run but it wasn’t enough to take the win. “This is my first time Western Australia and to Bunbury, it’s an awesome town, great food and local wine so yeah happy to be here that’s for sure” said Dowdy. Step up Tony Iacconni (Aus) and water conditions turned to butter. It all went Iacconi’s way, with an amazing run finishing up with a double flip to take out the tournament. “It was a fantastic result for me and I really needed that boost going into Moomba” said Iacconi also adding “what an amazing and beautiful part of world it is here in Bunbury, I never really knew where Bunbury was and I am truly stoked I came here, amazing waterways, feels very safe and great people, I’ll be back for sure”. Overall, it was an awesome weekend of full on action sports entertainment in Bunbury this weekend, with the Skate, BMX and Scooter competition taking place in the Bunbury CBD skate then in Bicentennial Square spectators were treated to extreme sports action with some of Australia’s best Freestyle motocross stars taking to the air. The event was surrounded by some amazing food trucks serving up an international fare of cuisines to the fans. Event Director Tim Thirsk said, “couldn’t be happier with the way things turned out, fantastic weather, great crowds and excellent support from our sponsors, Healthway through Drug Aware, City of Bunbury, Tourism WA through the Regional Events Scheme and Nautique West plus a host of local support from GWN7, Hit FM and Bayview Bar and Restaurant”. Action Sports Games is a multi action sports event combing BMX, Skate, Scooter and Freestyle Motocross, and an international Pro Wakeboard competition. The event is proudly sponsored by Healthway promoting Drug Aware, Tourism WA Regional Events Scheme, The City of Bunbury and Nautique. Local sponsors: GWN 7, HitFM. Bayview Bar and Restaurant, Minority Clothing. Copyright © 2018 Action Sports Games, All rights reserved.